Formed just 300 years ago, Nea Kameni, or simply “the volcano” as it’s referred to by the locals in Santorini, is the Eastern Mediterranean’s youngest volcanic landform. Greece was a land that was shifted and shaped by its many volcanoes raising islands in the sea and carving off cliffs into the mainland. It’s been a while since any of the volcanoes in Greece were last active, but if you want to visit somewhere to experience the dramatic remnants of such explosive forces, then these destinations are perfect for you. Any list of Greece’s volcanic island would naturally have to be topped by Santorini. This island is gifted with a natural beauty and a wild scenery created by the eruptions that happened between 1613-1614 BC. The force of such discharge resulted in the collapse of the mouth of the volcano, resulting in the formation of the iconic caldera we know and love today. 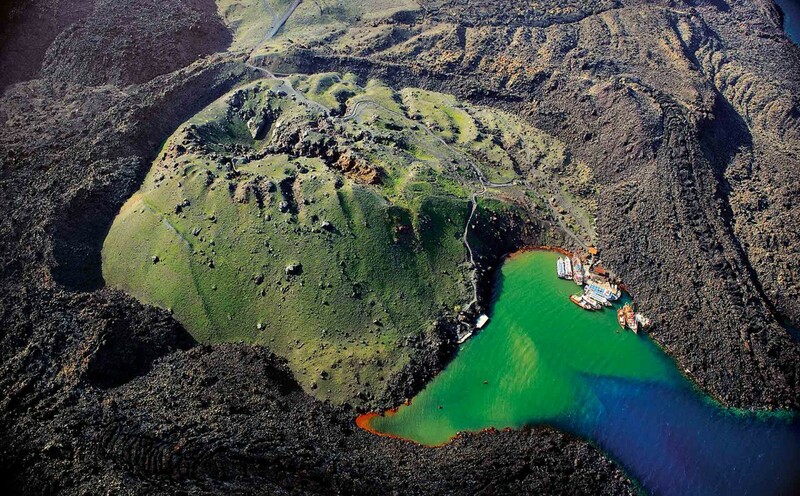 In the last 400,000 years, the volcano has erupted and been reborn from its ashes 12 times, causing dramatic changes to the archipelago’s morphology. 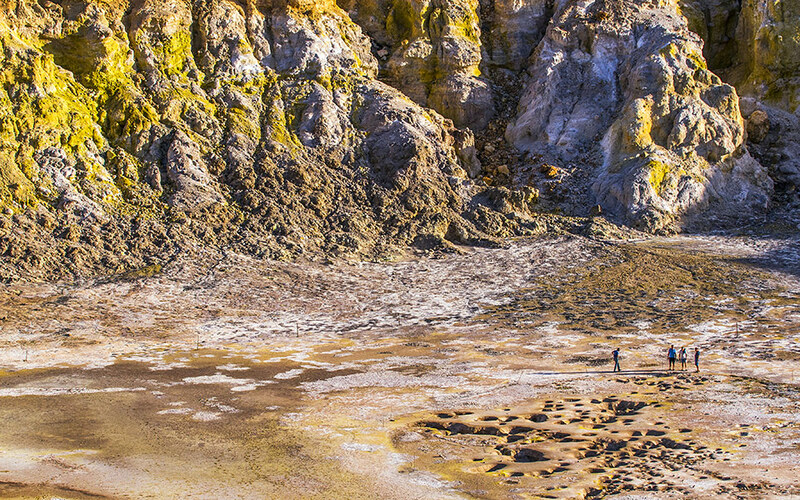 The area has been calm since 1950, when the last lava outflow was recorded, with the hot springs bubbling up from the sea and the vapors around Nea Kameni being the only evidence of activity. Visitors can take ferry rides out to the caldera to experience the dormant volcano’s hot springs and hissing sulphur vents. The legacy of Santorini’s creative force has been the volcanic soil which lends a particularly sharp and strong flavor to anything that grows on the island, as well as the gorgeous, multicolored volcanic beaches which hug its shores. Nisyros, the remote beauty of the Dodecanese, has always been shrouded with mystique because of its volcano which has not erupted since 1888, but remains quietly active. The entire island is in fact a volcano, with a 4 km caldera at its center and five smaller craters, the most imposing of which is the 3,000 to 4,000-year-old Stefanos. With a depth of 27m and a 330m diameter, it is considered the largest and most well preserved hydrothermal crater in the world. Like a sleeping beast, it’s still puffing sulphuric fumes from its many fumaroles, making it hard for some people to visit the area. Last summer, Stefanos hosted an enchanting concert right inside the crater that played improvised classical music for over 10 hours under the August moon. Milos is home to a dormant volcano which hasn’t erupted since 90,000 BC. Kalamos is at the heart of one of the island’s oldest volcanic centers. The volcanic steam and gases emitted into the atmosphere reach temperatures of 100 degrees Celsius, and the volcano has left its mark on the island through the rich minerals deposits and unusual geological formations it created. 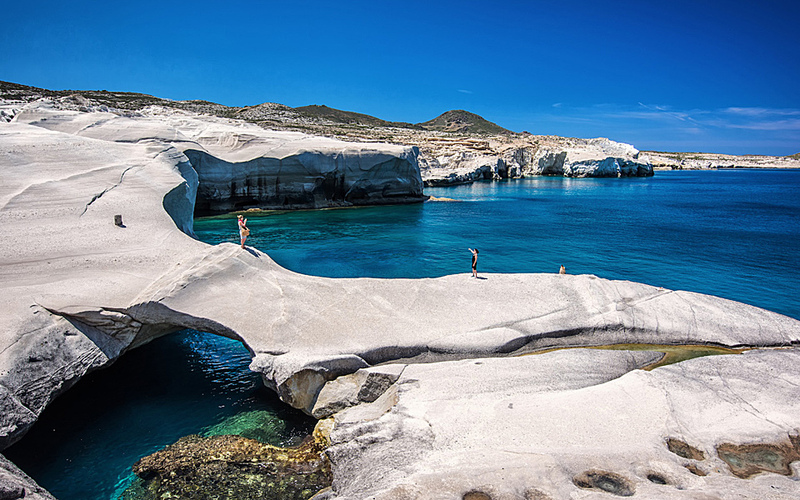 Milos offers over 70 beaches ideal for swimming and discovering the island’s volcanic legacy , including Sarakiniko beach for its smooth white rocks or Papafragkas with its ochre rocks. 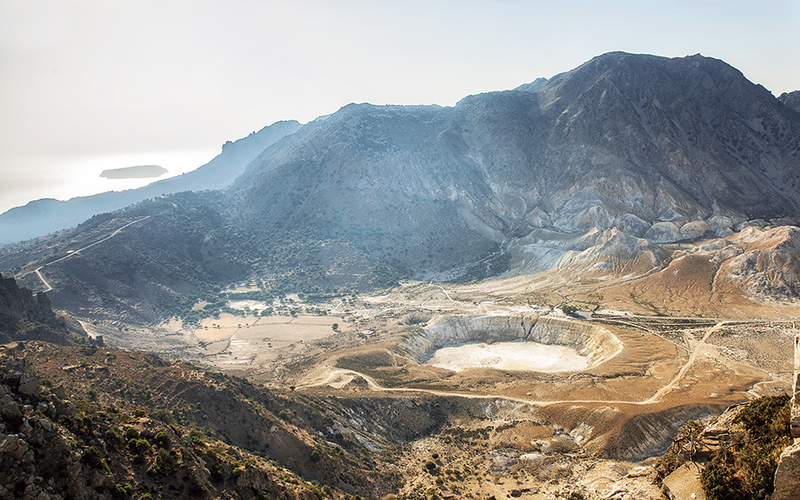 For a more extensive experience involving the volcano, begin with the Milos Mining Museum and then select and explore one of the marked routes, an initiative organized by the Miloterranean group. The result of the volcano’s presence on the island’s geology has made Milos rich in minerals. A significant proportion of the island’s population works at the mines, which make up a large part of Milos. The Aggeria mine is Europe’s largest bentonite mine. Bentonite clay is used as a detoxification aid. Kaolin is also widely present and ideal for homemade beauty treatments. Grab a bag to make your own face masks. Smaller and less well-known than the other volcanoes on Greek islands, Kos’ volcano hasn’t created the same dramatic landscapes as those elsewhere, but can still be observed in other ways. Near Psalidi beach, close to the main town, you’ll find the beach of Therma, also known as Bubble beach. Here, warm springs from under the sands heat the water and release it to the surface with streams of bubbles.The hot springs are full of beneficial minerals for a relaxing soak, and kids love the phenomenon of the bubbling waters. Because of the thermal springs, the beach stays active even in the winter. 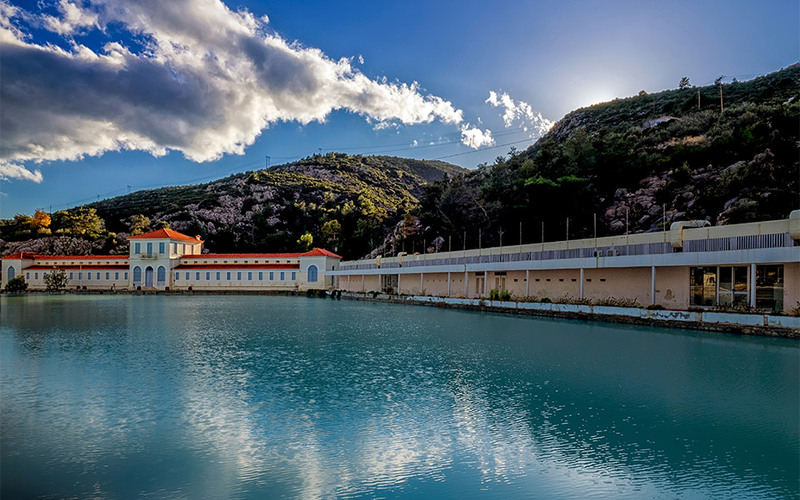 In Methana, a spa complex has been built to exploit the healing properties of the thermal waters. Not an island but a peninsula on the Peloponnese, Methana owes its existence to the volcano that still bubbles beneath it. The volcano has created a stunning landscape with rich flora and and fauna for those who love the outdoors. A spa complex harnessing the volcanoes hot springs also operates here, turning the destination into a popular spa town. Other effects of the volcano can be seen in Paleokastro, where the remains of the ancient walls and gates of an acropolis which fell into the sea after a volcanic eruption still stand. You can stand on top of old, solidified lava flows and see their wild beauty for yourself. After a day exploring the various volcanic features dotted around Methana, unwind in the gorgeous volcanic beaches of Nissaki Ayion Anaryiron, Limniónas and Vathý.